Today we think of cemeteries as spooky, haunted places that we avoid, or as sad, depressing spots reserved for funerals. But they were once quite the opposite–in fact, they were the earliest incarnations of public parks. In New York City, burials took place on private or church property up until the mid-1800’s when commercial cemeteries began popping up. 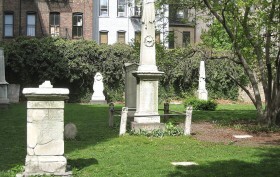 And in the East Village there are two such early burial grounds hidden among the townhouses and tenements–the New York Marble Cemetery (on the west side of Second Avenue just above Second Street) and the New York City Marble Cemetery (on the north side of Second Street between First and Second Avenues). Though their titles are extremely similar and they’re located less than a block apart, the two cemeteries are operated separately and have their own unique history. And during openhousenewyork weekend, we were lucky enough to take a peek beyond the cast iron gates and into these important pieces of the East Village’s past.